The shop showcases artworks by Kolkata based artists Sunil Thapa. He paints with acrylic , on paper and canvas. 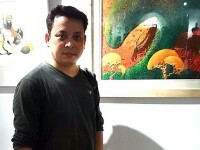 He has showcased his artworks through sevaral shows. Artworks shall be shipped rolled via reputed courier services only, please do not accept the shipment if it appears damaged/tampered with on arrival.